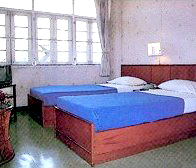 YMCA International Hotel Chiangrai is a good choice for accommodation, conveniently located only a few kilometers from the attractive downtown of Chiangrai, and 5 minutes from the Chiangrai International Airport. It is surrounded by the green fields and rural charm of the province. Chiangrai is Thailand's northernmost Province. Its boundaries are connected with Myanmar and Laos with Dan Lao Mountain and Mae Khong River flows throughout the area. The lagest attraction of Chiangrai is eco-tourism: trekking, cycling, bamboo-rafting, elephant riding. You may go shopping at the exciting border market in Mae sai or take a boat trip along Mae Khong River. 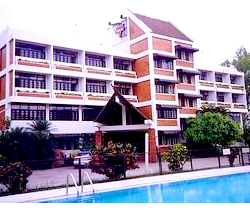 The location of the YMCA is about 2km from the Night Bazaar and Markets of Chiang Rai. The best transportation option is the green or blue song teaw, though tuktuks can be called for you if you want to pay 6 times the price. It is noisy during the day due to the day care. There is an attached restaurant, but no other food options nearby unless you go into the city. The pool seemed clean, but used by the day care during the day. like because of suitable price. Quite easily, the best thing about the YMCA is the folks who run the place. The location, comfort etc. are good, but are nothing compared to the hospitality. Very strongly recommended.